Gold is not a good inflation hedge. Yes, it has been touted as one in the past and continues to be touted as one now, but there is little evidence supporting the claim. What’s more, it is rare that any wealth manager or gold bug or purveyor of such an idea will tell you why or how the yellow precious metal is an effective hedge. The argument is typically presented as nothing less than a simple statement of fact, a truth everybody should already be familiar and comfortable with, something that can even be considered self-evident. If any reasoning is provided at all, it might sound something like this: Fiat currencies are not backed by anything anymore, unlike before when they were backed by gold. Hence, as central banks the world over pump paper into the system to salvage their ravaged economies, it is inevitable that they will ultimately devaluate their own currencies and trigger inflation in the process; they will overdo it, make a misstep, screw up. People will “wake up” and realize that paper is just paper, that the overzealous “printing” of it has created an overabundance of it in the hands of humans chasing too few goods, and that same general public will lose confidence en masse in their central bankers and in the currencies they have been (mis)managing. As confidence is lost, so will value and purchasing power be. The veil will be lifted and everyone will awake from their stupor to the ever-present reality that paper is not like gold, the latter being a physical, naturally-occurring material that is in limited supply (there’s only so much of it that can be reached, anyway); gold is a tangible thing that must be mined, processed, and stored, whereas paper is just, well…paper. Under this model, gold has “real” value, while currencies do not. Without diving into the intricacies of the fiat monetary system, this basic tenet of the paradigm is problematic on its own; the value of something is ever only “real” if people agree to that item having value in the first place. Currently, people at large agree that both gold and currency have “real” value, so gold’s value cannot safely be considered more “real” than that of fiat paper money. Gold supporters expect this to change, perchance, but so far it has not. Moreover, gold’s value is still expressed in terms of some currency (often $USD), so in that case, currency must continue to have “real” value until the day we begin to express the worth of gold in terms of something else, wouldn’t you say? To reiterate, gold’s value is no more “real” than currency’s. And make no mistake, that value is subject to change, depending on the circumstances. In a modern apocalyptic or post-apocalyptic world, a seed may have more value than some weight of gold, which in turn may be considered utterly useless. Nevertheless, suffice to say that the gold-hedges-inflation paradigm and its pillars are commonplace. When people realize the worthlessness of their paper money, when they see that their purchasing power is decreasing, they will flock to the “real” store of value — gold — driving the price up. Or, maybe the proponents believe that in a period of inflation, gold, like everything else, will cost more in nominal dollars. If you are already holding gold going into a period of high inflation, then what took you less than $1,300 dollars an ounce to buy today will be worth some much higher value in nominal dollars per ounce when inflation hits. If you are not holding gold when that moment strikes, you’ll still only have the same number of dollars you had leading up to the chaos, and that cash will now buy you less if you don’t beat others to the punch and quickly invest it in something of “real” value like the yellow metal. Of course, the time to buy is now, they urge you, before inflation hits. Otherwise, you’ll be caught chasing a runaway train. Logic aside, the main issue with the concept of gold as a functional hedge against inflation is that there is no consistent historical data to support it. In the past, there have been as many instances of gold not hedging inflation as hedging inflation; possibly even more cases where it has failed. In other words, gold’s behavior as a hedging instrument during inflationary periods is entirely unreliable. What good does a hedge do you if you can’t count on it to hedge risk on a more or less dependable basis, i.e. at least regularly or most of the time for some given situation? With an inconsistent hedge, you are now gambling…gambling that gold will work the way you wish it to. That’s not sound risk management. In 2012, Claude B. Erb and Campbell R. Harvey published a study entitled, “The Golden Dilemma”. In it, they set out to understand how gold should be treated in terms of portfolio asset allocation and, among other things, to understand what drives gold prices by investigating common arguments for owning gold. They acknowledge that one such justification for investing in gold repeatedly presented over the years is that it can be utilized to hedge inflation. However, the two find little to no evidence that gold is an adequate hedging instrument against inflation. 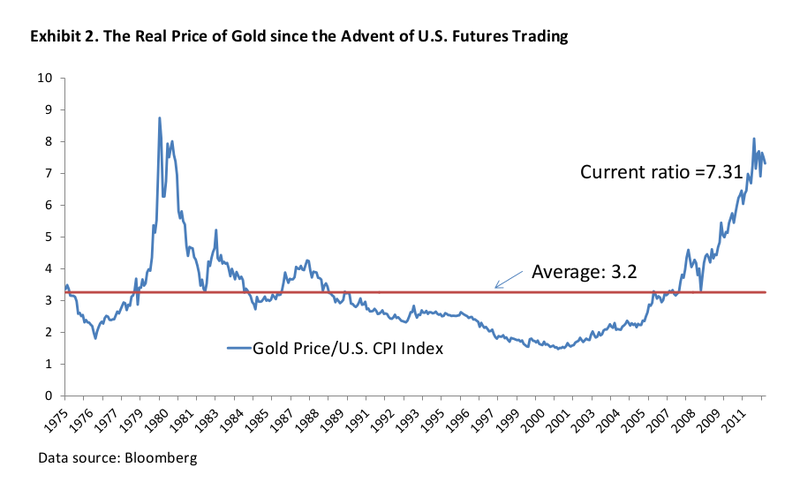 True, leading up to and then during the horrendous inflation of 1978–1981 in the United States, with the peak value realized in 1980, the real price of gold (calculated by dividing the nominal price of gold by the CPI value month-by-month) spiked. This makes gold investing appear to have really paid off as an inflation hedge during those years (see chart below). One takeaway is that during that time period, gold more than succeeded at maintaining its purchasing power (better than the US dollar did, at any rate). Fair enough, but if gold is to faithfully serve as a good short-term hedge of inflation, then we should see that again and again, and the real price of gold — nominal price per ounce of gold divided by CPI — should hold steady with little price variability; it should remain stable. Why? The nominal price of gold should move in lockstep with the CPI, if it is indeed a superior inflation hedge. For an increase in the CPI, signaling inflation, we should see a commensurate jump in the nominal price per ounce of gold. Over time, the results of our little equation should paint a picture of constancy. However, if one looks at the entire period of 1975 (when futures trading in gold began) through to the time of publication of the paper, 2012, it becomes immediately evident that the real price of gold as calculated thusly is anything but constant. Rather, it fluctuates considerably, as the chart sourced from the study below shows. Over the sample period, the real price of gold (nominal price / CPI) falls all over the place, belying its reputed ability to hedge against inflation. Erb and Harvey go on to compare the actual change in the inflation rate (as a stand-in for unexpected inflation) with the historical percentage change in the price of gold year over year. 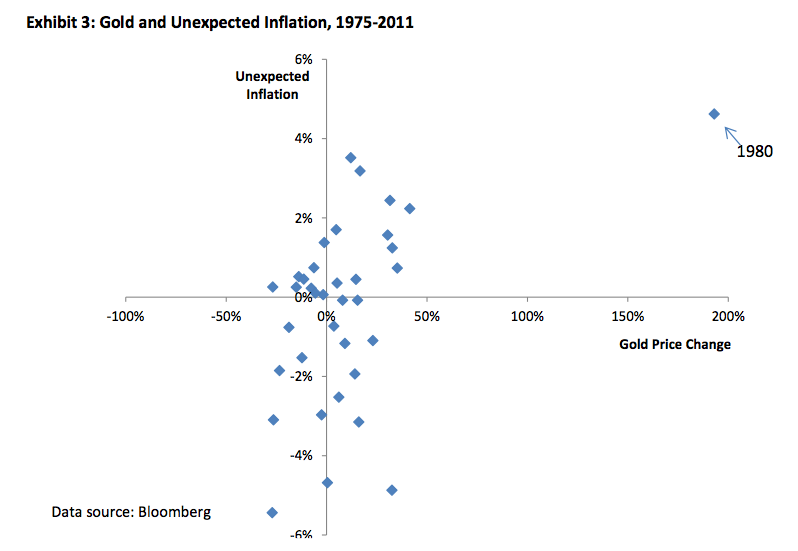 Once more, they observe essentially no correlation (only the outlier year 1980 stands apart), indicating that gold similarly does not hedge unexpected inflation. Below is a view of the unpredictable and irregular relationship between the two. Notice the lack of correlation between gold returns and changes in the inflation rate; in many cases, negative changes in the inflation rate correspond with positive percentage changes in the nominal price of gold, and vice versa. If gold did function well as a hedge of unexpected inflation, we would expect to see a positive relationship between changes in unexpected inflation and gold returns, but the graphic displays nothing of the kind. Even in historical cases of hyperinflation, such as that involving Brazil from 1980–2000, Erb and Harvey don’t uncover evidence that gold successfully hedged inflation. Regarding the Brazilian example, they actually reveal that the real rate of return on gold ownership was a negative 70% over that period. Granted, you wouldn’t have seen as much erosion of your wealth if you had been in gold instead of the Brazilian real, but you wouldn’t have escaped unscathed, either. Elsewhere in the essay, the authors compare 10 year gold returns (nominal and real) with the 10-year CPI inflation rate. No discernible relationship is found, signifying that when 10 years is considered the long-term investment horizon (as opposed to, say, 30 years), gold has likewise not acted efficaciously as a long-term hedge against inflation. 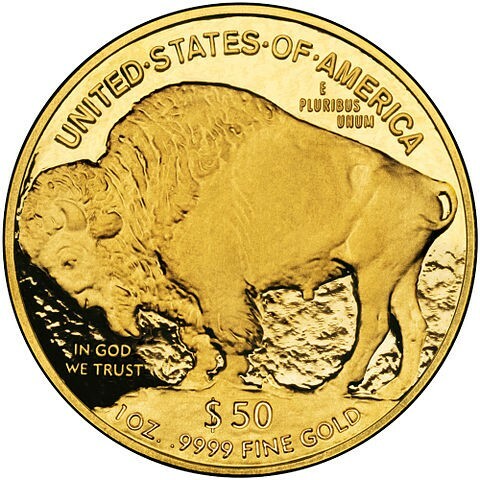 They review the mean reversion of the real price of gold; they compare nominal disposable personal income against per capita nominal disposable personal income expressed in ounces of gold in the United States; they look at military pay in ounces of gold throughout history; and they investigate yet other avenues, apparently attempting to exhaust through whatever means possible all reasonable ways of testing whether gold has served as a credible hedge against inflation over time. Without going into every single detail of the various aspects of their research, they — for all intents and purposes — come back with little to no evidence that gold is a compelling hedge whatsoever against any type of inflation. I n the end, one may choose to hold gold for some alternate reason, perhaps most wisely because its performance often correlates poorly with the performance of other asset classes such as equities and bonds. This is appealing for those wishing to form a well-balanced and diversified investment portfolio. Forget about predictably hedging inflation, though. There are better ways to attain that objective. The argument that the yellow precious metal will consistently do the trick is fools’ gold.